Not only was the food delicious, the presentation was an art form. 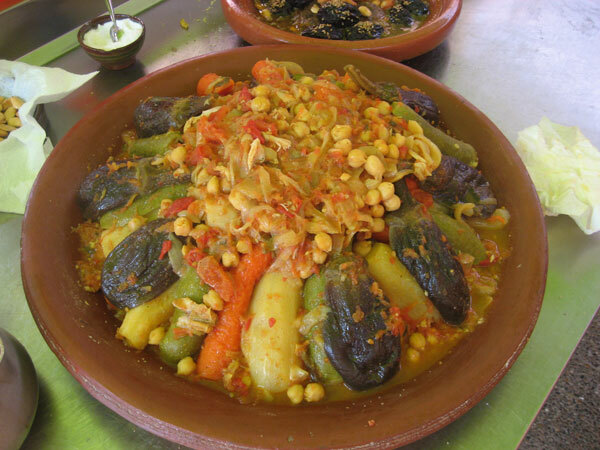 I had one long, straight, light green summer squash left in the garden, the weather was getting cooler, and I was remembering the beautiful tagines with the large vegetables circling the lamb. Mine didn’t turn out quite that way…. To be fair, I had the same size tagine but was making the dish for two, not 12 so the proportions are a bit different. The taste, however, was spot on! Add lamb and brown on all sides. Remove to a plate. Add the onion, garlic, and sauté until tender, about 5 minutes. Add ginger, paprika, cumin, and stir-fry briefly. 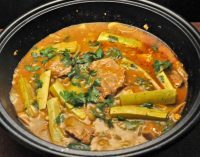 Return the lamb to the pan, add zucchini, tomatoes, juices, stock, za’atar, cover, turn heat to low and braise for 25 minutes. I hate cleaning but even I acknowledge that it needs to be done periodically. This time was the semi-major ‘fall cleaning’ (as opposed to the major spring cleaning). I also find cleaning to be somewhat bittersweet. Well, not the toilets and oven and dog dishes and such…. It’s the dusting that usually makes me melancholy. When my siblings and I first left the nest and found places of our own, birthday and Christmas gifts were ‘something for the house’. Initially they were useful things but, as we got older and more established, the gifts were more decorative: vases, figurines, ornaments and such. As I’m dusting each one, the memory of who gave it to me and for what occasion comes flooding back. Then my mother decided, unilaterally, that we all had too much stuff. We started getting cook books. Not big fancy cook books but small, interesting cook books. 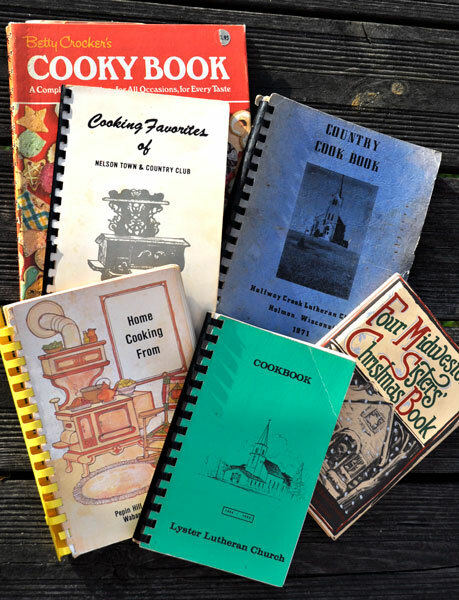 Her favorites to buy and give were the church cook books produced by many of the local congregations, as well as the village ‘home-makers’ groups. The recipes were all contributed by the ‘ladies of the church’, the books were usually typed locally, and put in the plastic spiral binders. As you can tell, the blue ‘Country Cook Book’ has gotten a lot of use…. It’s where I get my favorite sweet (tea) bread recipes. My mother would normally buy 4 of the books: one each for herself, her sister, my sister and me. And yes, discussions would ensue about the various recipes…. I mean, who can resist Ritz Cracker Pie or Confetti Sandwich Spread (hint: it contains ‘1 can Spam’) or Hot Dish? Okay… I’ll stop making fun. 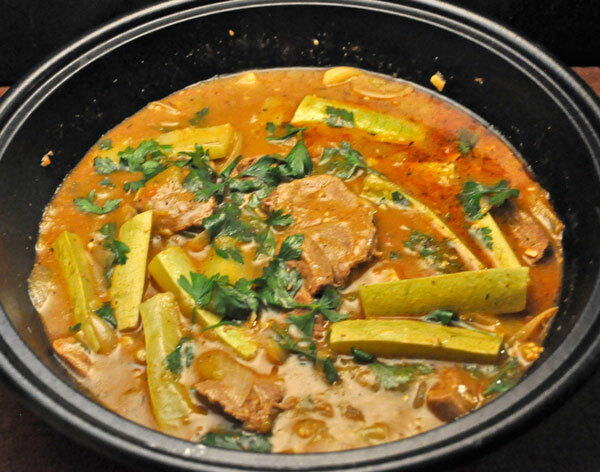 I admit I am not making many of the recipes, but I do enjoy reading them and getting a look into how people cooked in the past and what they considered their best recipes. I also find it interesting to see how the women identified themselves. Most of them are listed as ‘Mrs. John Smith’. Occasionally there will be a young, forward thinking rebel that lists herself as ‘Mary Smith’, but there aren’t very many of them. My mother had 2 recipes in her local group book (the white one, top left): Red Devil’s Food Cake (that’s what red velvet cake was originally called) and, my personal favorite, Rhubarb Wine. There gone now, my mother, aunt and sister…. but I still have the books and the memories. Lovely way to get through the dusting !! I don’t dust my books. Years of not dusting my books and you have so many.